Barely noticed by most consumers, half pallets are part of a supply chain revolution, often carrying goods directly from the producer to the consumer, reducing costs and improving the reliability of supply in the process. What Is a Half Pallet? Generally, it’s one with an area half the size of a standard pallet, but it isn’t a precise term, because the size of a standard pallet has varied from country to country. Pallet sizes must fit shipping containers safely and efficiently, so are subject to strict definitions. American standards are based upon one 48”x40” – so half sizes are either 48”x20” or 24”x40” (ISO Standard 6780). In Europe a near approximation to the 48”x40” is recognised – the EUR2, 1200mm by 1000mm – but the EUR1 “Euro-pallet” standard is 1200×800, making the (EPAL) half pallet 600×800. Why Is Their Popularity Expanding? Certain retail sectors, especially building supplies and garden centres, realised that many products could be displayed as shipped on a pallet, making significant savings in time and labour. Half-pallets are even more suitable for display in-store and allow a wider range of goods to benefit from the same savings. Retailers who tried this discovered increases in sales – partly because it’s easier to keep high-velocity shelves permanently stocked (with goods like toilet tissue or bottled water), but also because customers actually like it. It corresponds with a back-to-basics trend in society as a whole and makes the customer feel the simplicity is saving them money (which it is). Hauliers are discovering benefits too. It’s easier to minimise wasted space in a trailer using half pallets. As a result, load per journey is increased and the stability of the load improved – with a reduction in goods damaged in transit. Pallet overhang is also reduced because it’s inexpensive to use an additional smaller pallet if goods don’t fit, whilst space is saved on pallets that wouldn’t have carried a full load. In many instances, damage is reduced simply because the weight is less and handling easier. With weight reductions some goods require less additional protection, such as heavy cardboard boxes. It’s been estimated this alone is saving 5% on packaging costs across the market. The half pallet reflects and facilitates changes in supply chains, with more outlets taking direct delivery rather than depending on middle men to break pallets for them. Smaller pallets also permit the wholesaler to re-distribute goods with reduced picking costs (it’s been estimated these pallets have already reduced picking costs by 25%). Pallets have been quietly creeping further into the high-traffic areas of our superstores. They are no longer confined to heavy goods like pots, bricks and sacks but now often carry luxury goods too. They’re now also appearing in small convenience stores. Smaller pallets fit through doors and narrow aisles impassable to bigger ones. 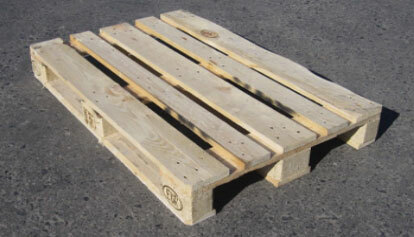 Pallets themselves have been evolving to suit their new markets. Four-way instead of two-way access for forks and jacks is more versatile in restricted spaces, and deckboards with tighter gaps are suitable for smaller goods. With their increased value and public visibility, we can expect a better finish on a wooden pallet and for it to last longer.